There is certainly still a market for full gold restorations and our metal technicians revel in creating the morphology and fit. Whilst some patients may prefer the look of full gold restorations they also have long term durability making them a great candidate for posterior restorations. 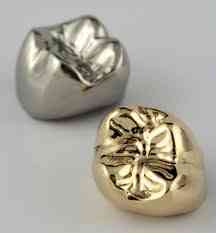 Gold restorations can be constructed in white yellow precious or non precious.